Many people don’t feel dressed unless they have a knife attached to their person. From farmers to hunters to your average man, a knife is simply part of the ensemble. However, there are some serious weapons laws in this world today and many are wondering how they can carry a knife without being in violation of these laws. We have found the ideal alternative for this is a small knife that you can conceal and carry on your person without being obvious. The Kershaw Ken Onion Leek Folding Knife with Speed Safe is ideal for this purpose. The Onion Leek knife has a myriad of uses and should one find themselves in a bind, one could have something sharp to poke at an attacker and at least catch them off guard. If you are a hunter, you should probably read this review before you go out and buy another knife. The Spyderco Delica4 Lightweight FRN Flat Ground PlainEdge Knife is not like any other hunting knife in the market. If you want to know what sets it apart from the rest, you should continue reading. Released in 1990 alongside the Endura, the Spyderco Delica instantly made an impact on the market. This type of blade was the first of its kind in the market and brought some much-welcomed innovation that allowed them to make affordable, yet top quality one-handed opening knives. This instantly made them extremely popular and over the years both knives have been constantly improved thanks to Spyderco’s commitment to C.Q.I (constant quality improvement). Overall the Spyderco Delica is a beast of an everyday carry and should be one you should check out if you are in need of a top quality folding knife. This is the fourth version of the Delica knife, which was first introduced in 1990. Over the past two decades, the company has worked to make an already wonderful knife even better. Currently, there are four various colors to choose from. It has been made lighter and sharper. Here are more video details about this knife. One of Kershaw’s more expensive models currently on the Market is the Kershaw Junkyard Dog II folding knife and I must say, it definitely deserves the $150 ($65 or cheaper on Amazon) price tag that is attached to it. This is one hell of a knife and is my preferred everyday carry. This knife not only has an incredibly quality design but is also made out of top quality and high-performance materials to make sure you are getting a really nice blade. Now, this may cost more than your typical folding knife, however, this is going to last you much, much longer and I dare say that you won’t need to buy yourself another knife after you get your hands on the JYD II. When you handle a Boker Traditional Series folding and hunting knife there is a classic flair that will get you hooked. This has the classic components that modern and sleek folding knives seem to miss: nickel silver bolsters, artistic handles and brass linings. When you own one of the Boker folding knives with faux handles it’s either you keep it in a collector’s case or carry it anywhere in style. Measures 7 ¾ “ when opened and 4 7/16” when closed. 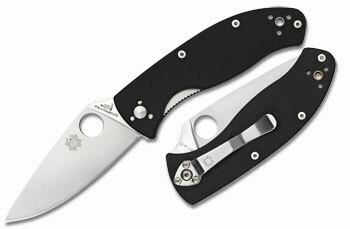 With a blade length of 3 3/8”, blade thickness of 1/8” and Spyderco Round hole with a diameter of ½ “. Weighs only 4oz. Spyderco Tenacious Plain Edge knife is a knife that you can take anywhere because it is small to carry in your pocket, bag or purse. It folds to just 4 inches but it opens to a 7+ inch, durable tool that you can use outdoors. The design of the Tenacious is modern with its Spyderco Round Hole for easy opening and its well-designed non-slip handle but it still retains the classic safety of a folding knife that is perfect for hiding anywhere. The blades are designed for maximum efficiency with its leaf-shape and flat shape from the blade’s spine to the edge. An oversized round hole is specifically designed to improve the way you open the blade; this hole will also be a perfect place to put your thumb in so you can work with confidence. Other features of the Tenacious Plain Edge knife are its 4-way pocket clip so you can carry it anywhere you go and its very light weight. This makes it the ideal knife to bring to short outdoor trips and to do outdoor projects with. The round hole also adds to the safety of this knife since you can place your thumb in this area to keep the blades where they should be. The price of this knife is another amazing deal. This is available online for less than $40. And with the features and the advantages that you get from this folding knife, the price is really a huge bargain. Although the Tenacious Plain Edge knife has amazing features there are still some disadvantages, especially with its design. The knife is not ambidextrous and hence may not be a great gift for left-handed people. It could be hard to find an ideal hex screwdriver that will fit into the screws of the knife. The Spyderco Tenacious is a truly great deal since it is affordable, sharp for outdoor use and has a classic design that you can find in safe and versatile folding knives but has a modern twist when it comes to the blade and handle materials and design. There are small flaws but the features technically overlook these small disadvantages. 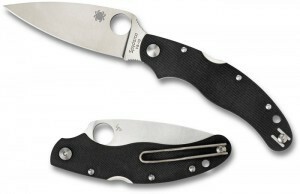 If you are a fan of good knives, you may already be familiar with the Calypso by Spyderco. It is a very versatile, medium-sized folding knife. It has a leaf-shaped blade, and it was originally designed as an everyday knife. The blade is durable, sharp, and feels good in the hands of the most people. This is a knife that was designed and manufactured to be used every day. The Caly 3.5 is a variation on the design of the original Calypso blade, so it has a lot of the same advantages. The biggest difference is that it has a larger three and a half inch steel blade. The blade is thicker at the tang. It tapers in towards the pointed tip. The blade’s cutting edge has been ground flat, and it is very thin so you can use it for precision work. The handle has been designed with comfort in mind. It also has a very well-set finger guard that can help you stay safe and work with a steady hand. The spine of the blade has crosshatches for added texture and a better grip. The durable handle also features a back lock and pocket clip for your convenience. In fact, most people say that it feels so comfortable that it is almost like an extension of their hand. You can be assured of many years of steady use from this blade. The company, Spyderco, backs up each knife that it manufactures and sells with a limited warranty that protects customers against defects in workmanship and materials too. You will get the details of your warranty with each purchase. 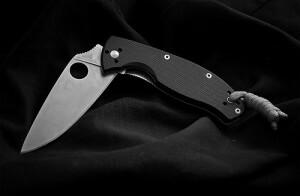 Spyderco, as a company, has built a reputation for its ability to think beyond the limitations of other knife companies. Some famous innovations that were introduced by this company include pocket clips, one-hand knife opening, and more. The company has also been very focused on the research and development of better materials to produce blades that are better functioning, more durable, and increasingly reliable. Each product gets tested before it is released to the market, so people who are familiar with this brand are not wary of purchasing a new model. Some of this testing include edge retention, rust resistance, the force needed to open or close the blade, and much more. All of this high-tech testing is done so you can be assured of receiving a useful and durable tool that feels like it was made to be an extension of your hand. What Do Other Reviewers Think Of The Caly 3.5? Customers who have already purchased the Caly 3.5 tend to give it favorable reviews. They mostly like the way the knife feels in their hand when they use it. They also say that the blade is very sharp. Some users did not care for the way the knife opened and closed. Others said that it was harder to clean than some other knives that they had used in the past. Should You Buy A Caly 3.5 Knife? If you want a modestly priced and medium sized folding knife, this is a good choice to consider. It has a very sharp edge, and it is also known to feel comfortable during long periods of use. The major complaint is that there is no way to disassemble to clean the interior of the knife. If you want that extra feature, you might have to spend a lot more money to get it. The Buck Knives 110 Folding Hunter is a classic folding knife with a nail-notch longback design. It may look like a threatening piece of metal but it is one of the safest Buck Knives models in the market. Buck knives are renowned for their quality, there is no denying that and the Buck 110 is one of the reasons for this. This beautiful knife not only looks sensational but also feels great in your hand and works like a treat. This knife has been around for years with some even claiming to still be using their’s a solid 35 years after they got it. That is one of the features that makes this so great – the fact that it is a reliable and long lasting knife. This is a great hunters knife that is perfect for skinning and field dressing because it can easily clip onto your belt. You will see this knife with many different names for the same knife such as Buck 110 hunter, Custom Buck 110, Buck 110 Switchblade, Buck Hunter 110, Buck 110 Folding Hunter, and many others all for the same style knife. The Buck 110 folding hunter is one of the most well-known knives in history. 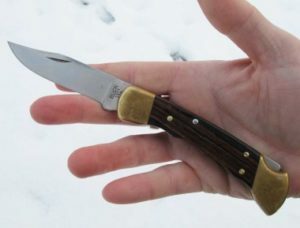 When you see the Buck 110 folder it brings back memories of when you were a child and received your first hunting knife. It has that wood inlay handles, those nice gold shiny end caps and that locking tab on the back end. The knife features a 3 – 3/4 inch stainless steel blade, so it is a good length and not too long. The blade is razor sharp and will keep and edge for a while which is why many people cut themselves when they first get their Buck 110. The blade is two handed opener unlike a lot of the modern one handers out there, but that really isn’t too much of an issue as you will quickly get used to the amount of pressure needed to open it. One benefit this older style has over the new one handers is that if dirt or dust gets in their springs, they can break or become extremely difficult to open, whereas the Buck 110 folding will keep working day in day out. One of the main attractions to the blade is the natural wood grain handle. This looks absolutely beautiful and is a real piece of art, not to mention the brass bolsters! The knife comes with a black leather sheath and the Buck unconditional lifetime warranty (not that you will need it). A pocket knife must be practical to use and to carry around wherever you go. It must also be strong and durable for outdoor or indoor use. In your search for the best pocket knife, you may have seen the ZT logo which is the symbol for Zero Tolerance. 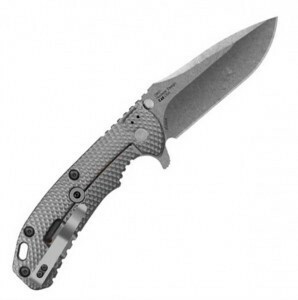 ZT Zero Tolerance 0561 is a pocket knife that belongs to the high-end knife brands. It is high end not just because it is more expensive than most pocket knives but because of the amazing features and advantages it has over other knives of the same size and style. 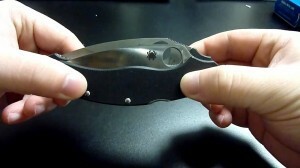 Check out this ZT Zero Tolerance 0561 video review to find out more about this special pocket knife.